When you’re hungry and don’t have time to cook or sit down for a meal, fast food is the best solution. 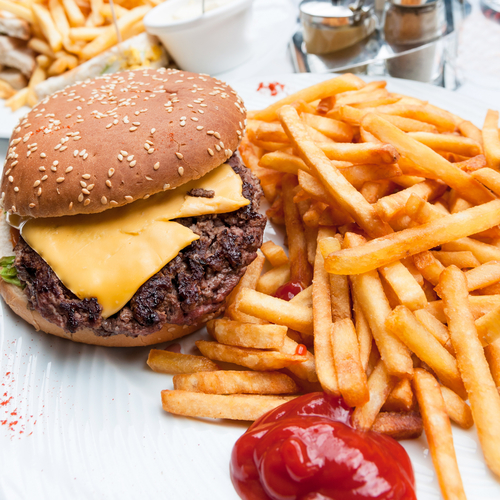 Whether you’re craving a juicy, cheesy hamburger, a meaty sandwich, or something else, you’re likely to find it at a local 24-hour restaurant and get your meal in a matter of minutes. Here are a few benefits of eating fast food rather than opting for a traditional sit-down establishment. When you’re hungry, the last thing you want to do is wait for your food to be prepared. At sit-down restaurants, you can expect to wait as long as 30 minutes for your meal to reach the table. By ordering a delicious hamburger and fries, you’ll satisfy your craving within minutes of placing your order. It can be difficult to fit dinner into a specific time each day. Sit-down restaurants often only serve meals during specific hours. Fast food establishments have longer hours, giving you the freedom to eat when you’re hungry. There’s no need to adjust your schedule around the restaurant’s hours as many are open 24 hours a day. When you eat at a sit-down restaurant, you’ll likely be charged a higher price and have to leave a tip for your server afterward. Fast food is a more affordable way to feed the entire family. You’ll each get what you want without breaking the bank. Some restaurants have such limited menus that it can be difficult to find a meal everyone will enjoy. When you head to your favorite fast food joint, you’ll know everyone in your party can find something they’ll enjoy. After all, nothing beats cooked-to-order cheeseburger plates or a sandwich with all the fixings. If you’re looking for delicious fast food in the Rochester, NY, area, stop by Steve T. Hots & Potatoes for a plate of your favorites. Their family-owned restaurant is open 24 hours a day to help you satisfy your cravings even in the middle of the night. View their menu online or call the restaurant at (585) 429-6388 for more information.